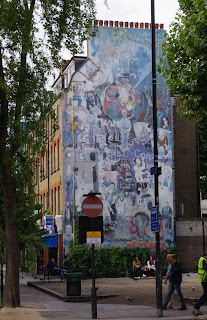 There will be a public meeting to canvas support for a project to raise awareness of Fitzrovia's heritage and restore the mural at Whitfield Gardens, on the corner of Tottenham Court Road and Tottenham Street. The project is being promoted by the Fitzrovia Neighbourhood Association with the help of the London Mural Preservation Society. The meeting is open to anyone who has an interest in Fitzrovia's heritage and conservation and who would like to see the mural restored. The mural restoration will be part of wider plans to promote awareness of heritage and conservation in an area of London under threat from commercial development.